Over the summer I worked on a WW1 Centenary Art Commission project called ‘Letter to an Unknown Soldier’ . It’s part of the 14-18-NOW programme of activities and events and was inspired by the Charles Jagger statue at Paddington station of an unknown soldier reading a letter. 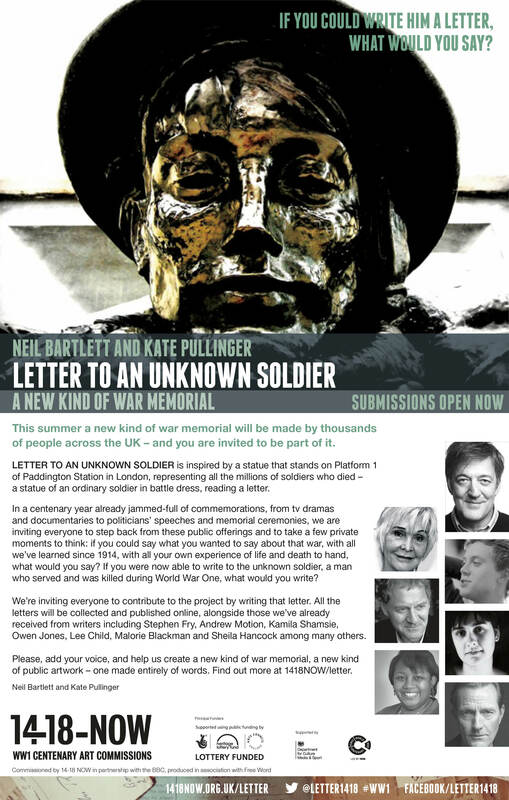 The project was produced in association with Free Word and from June to August this year the writers/artists who had originated the project, Kate Pullinger and Neil Bartlett, were inviting everyone across the UK to write letters to the Unknown Soldier to create a new kind of war memorial – made only of words. A number of established writers and public personalities were asked to write a letter to start the ball rolling, such as Sheila Hancock, Benjamin Zephaniah, and Stephen Fry, while our role as Project Champions was to recruit letter writers across our designated region – for me Bristol and the South West. By tapping into our existing professional networks we approached schools, organisations and communities as well as individuals to encourage people or groups to participate. I’ve undertaken similar recruitment drives for projects I’ve been involved with at Watershed over the years like Electric December, and Citizen Journalism and Media Literacy workshops and hoped my contacts from those would be pleased to learn about this opportunity. The simple idea, well designed website and straightforward submission process made it a very appealing activity, and excellent online resources for teachers and group leaders were an added benefit while the prospect for participants to be part of such a huge ‘memorial’ with universally available outcomes seemed like a winning combination. However, it did turn out to be a tricky time of year to get schools involved as they were all heading down the homeward slope to the summer holidays and many older pupils had already left prior to sitting GCSEs or A Level exams. A number of local and family history societies, WI, drama, youth, choir and writers’ groups had also already had their final summer meetings and wouldn’t be re-convening until the autumn. Fortunately though there were some enthusiastic responses and through the trickle-down effect of people forwarding the information to other contacts over 3,000 schools, organisations, young and older people in the South West got to hear about the project – and there were all the other contacts made by my fellow Project Champions across the UK too along with good media coverage. Most of the contacts were made via e-mail and phone calls but I also gave a couple of presentations and was able to talk to our local history society about the project at their final meeting before the summer break. A small group had been researching the 58 names on the two local war memorials to unearth further details such as the servicemen’s first names and their connections with the two linked villages. This resulted in the publication of a very touching book with brief biographies of almost all the men, a fair number of whom still have relatives living in the village. 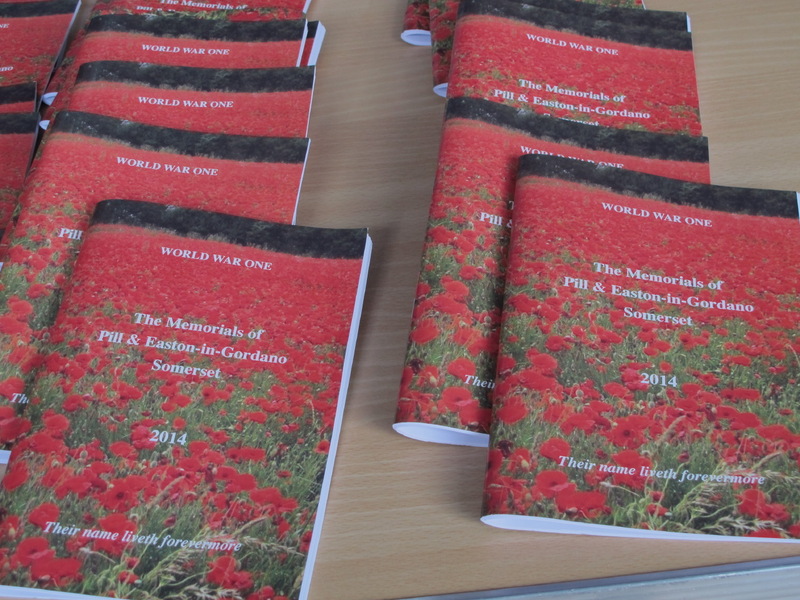 Pleasingly, some of the research group also wrote letters for the Unknown Soldier. I have mixed feelings about the commemoration process that is attached to wars but this project website made it clear this was not about glorification – some letter writers took the opportunity to recall the First World War through family memories and personal histories but more significantly it allowed people of all ages, the chance to express their feelings about the idea of conflicts, whether small or global and many young people submitted thoughtful and very personal letters on these themes. It felt like a very democratic and moving process and by the closing date, 4th August, the final memorial of words comprised over 20,000 letters which will remain online until 1918, when they will be included in a special archive at the British Library. This entry was posted in Work and tagged Unknown Soldier, WW1 Centenary Art Commission project. Bookmark the permalink.